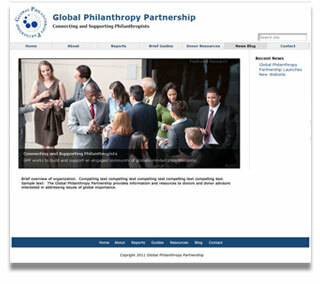 Global Philanthropy Partnership announced the launch of the organization’s new Web site. The non profit organization that was founded in 2003, provides information and resources to donors and donor advisers that are interested in addressing issues of global importance. The new website includes a news blog that will enable Global Philanthropy Partnership to inform the global community with breaking news and announcements. Please check back often to learn more about Global Philanthropy Partnership. Congratulations on your new Web site!